An organization’s aim is to maximize strength and minimize weaknesses. For this purpose, it looks toward better plans and procedures. The set target and goals need to be achieved in time. The organization must also focus on giving a strong cooperative and communicative environment to all its employees. The employees must also have freedom of speaking power. The workplace always approaches to strive for excellence. This can be done by focusing on different tools and tactics. It must focus on the tool of efficiency and effectiveness. The latest technology trend must be known. The latest product and services trend must be known. The recent market fluctuation and market growth trends must be looked for. Above all, the organization needs the employees to be professional and skilled to achieve all the above-mentioned goals and objectives. While hiring employees, the organization always looks for the experience and skills. But, there is a room for fresh graduates in almost all companies and organization. Once graduates and postgraduates start getting the job opportunities, then they can modify and show their unique skills. The organization focuses on giving different training sessions and programs for all employees. It improves the skills and techniques of the employees. It helps in building efficiency. It helps a lot in increasing knowledge. It also focuses on becoming competitive in the market. The employee training proposal must be containing the reasons for it and a summary of all the sessions to attend. It also gives a brief of covering the relevant areas of interest. If you get to choose between a trained and an untrained employee, it is clear that your choice will be the trained employee. Being unqualified and underqualified are two different things. An employee can be qualified by degree but can be under qualified due to a change in technological advancements. New skills come at a cost. Cost of time and money. Due to this spending, some employees might not keep them up to date with the new technologies. 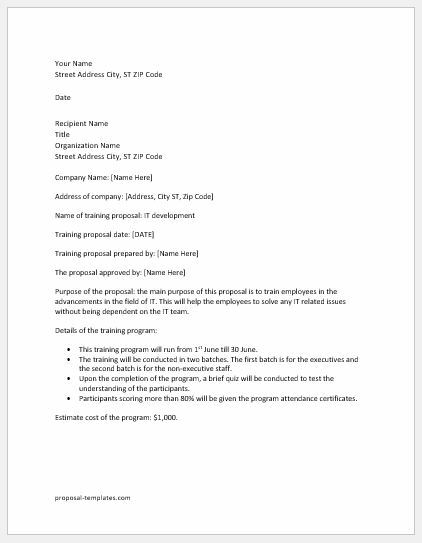 Purpose of the proposal: the main purpose of this proposal is to train employees in the advancements in the field of IT. This will help the employees to solve any IT related issues without being dependent on the IT team. This training program will run from 1st June till 30 June. The training will be conducted in two batches. The first batch is for the executives and the second batch is for the non-executive staff. Upon the completion of the program, a brief quiz will be conducted to test the understanding of the participants. Participants scoring more than 80% will be given the program attendance certificates. Estimate cost of the program: $1,000.